Last issue and this, I've been struck by how effortlessly writer Greg Pak has shifted the tone of his Incredible Hulks adventures with "The Spy Who Smashed Me." Part James Bond-style action movie, part snarky rom-com, part big budget special effects blockbuster, this story is a refreshing turnaround considering the darkness of recent arcs. For the last few years, Pak has kept his humorous side at play with co-writer Fred Van Lente over on The Incredible Hercules, the book that until recently had been home to the smartaleck sidekick Amadeus Cho. The Hulk appeared in Cho's introduction back in 2005's Amazing Fantasy #15 by Pak, so it's only fair that Cho repays the favor in time for Pak's exit from this book. Here, Cho plays "Q" to Banner's "Bond," infusing every scene with the same sardonic wit as with Herc. His mere presence infuses the narrative with a lightheartedness that's been rare in this title. That lighthearted quality is emphasized by the wonderfully expressive, clean artwork of Tom Grummett and Cory Hamscher. They're having a ball drawing big scary monsters of both the human and inhuman variety, beautiful women, and a certain green-skinned goliath. While the artwork has a fun feel, it also strongly hearkens to the best superheroic work in the biz. Edgar Delgado contributes his usual strong colors. Overall, it's quite the attractive artistic package. The plot continues this issue with Tyrannus having recruited Betty in his plan to steal the Pandora's Box of legend. Similarly, Banner recruits an expert in Roman crypto-mythology to help him stop the long-lived former emperor. 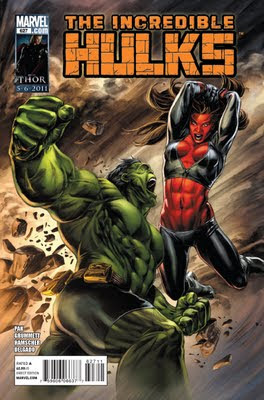 Of course, he's also got another stake in rescuing Betty, who risks being stuck as Red She-Hulk with each metamorphosis. These underpinnings are there in nearly every panel, but wisely Pak doesn't let them overwhelm the narrative to the degree they hamper the fun quotient. 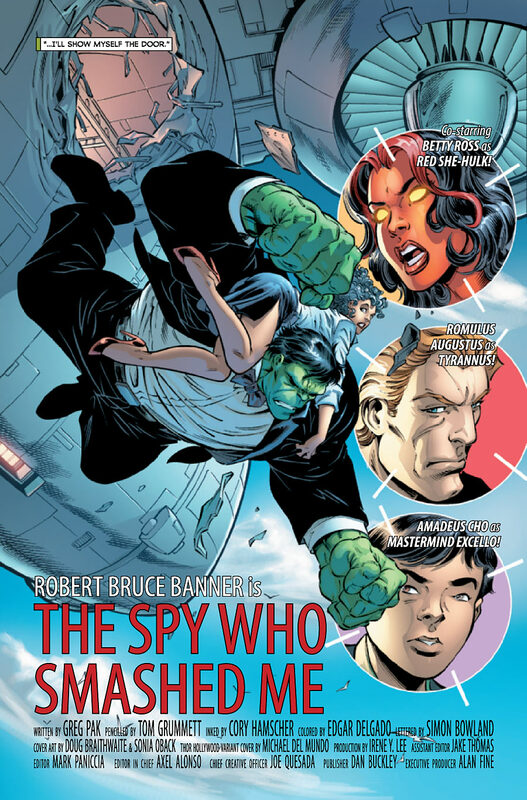 We're halfway through "Spy," and it's still as rollickin' a ride as it was last issue. With the supporting cast pared down to the bare essentials and hardly a gamma-enhanced being in sight, Pak has upped his game in this, his penultimate arc as Hulk writer, and Grummett, Hamscher and Delgado bring his vivid visions to life. If you've been wondering when the Hulk's tale would lighten up a bit, wonder no more. Incredible Hulks #627 brings the myth and humor of Incredible Hercules home in exciting fashion. Such a fun ride.Pak at his finest IMO. I'm loving the fun of the arc as well. In the first issue, I thought the art was by Paul Pelletier again; I'm sure putting this art team on Inc. Hulk was no coincidence. I'm most looking forward to the resolution of feelings between Bruce and Betty. Although she certainly has her reasons for being so, her bitchiness is beginning to grate on me. It's time for them to either officially get back together or officially call it a marriage. I just hope that, either way, they find peace between each other. I really enjoyed this issue, I really enjoy this storyline, and I can't wait for the conclusion! Some really good action and humor, which is something I really enjoy about this storyline. It seems like Pak is going to give us some great work before the deadly serious story arch, Incredible Hulk: Heart of the Monster.